LIFETIME WARRANTY FREE...1 OWNER... CLEAN CAR FAX...2016 KIA SOUL. This Soul COMES WITH A LIFETIME ENGINE, TRANSMISSION, AND FULL POWER TRAIN WARRANTY AT $0000.00 COST TO YOU! Come in and see why we're the one of the BEST DEALERSHIP IN ALABAMA #1 TO BUY FROM 4.7 STAR. We have had a Full Serviced with Fresh Oil and Filter Change, and a Full Inspection from top to bottom, so buy with 100% Peace of Mind. One Owner, Clean Carfax, so you can buy with Complete confidence there also. Inside this Kia Soul you can see it's Nicely equipped with All Power, Tilt Steering, Cruise Control, Keyless Remote Entry, AM/FM/AUX/USB Blue Tooth Radio, Automatic Transmission, and Steering Wheel Controls. Outside this Soul is 4 Brand New Tires w/ a Alinement, Alunimum Wheels,( NOT HUBCAP CAR) and It drives and handles great out on the road, and it's a Pleasure to drive in town. It gets an estimated 31 mpg highway too so you make fewer stops at the pump. 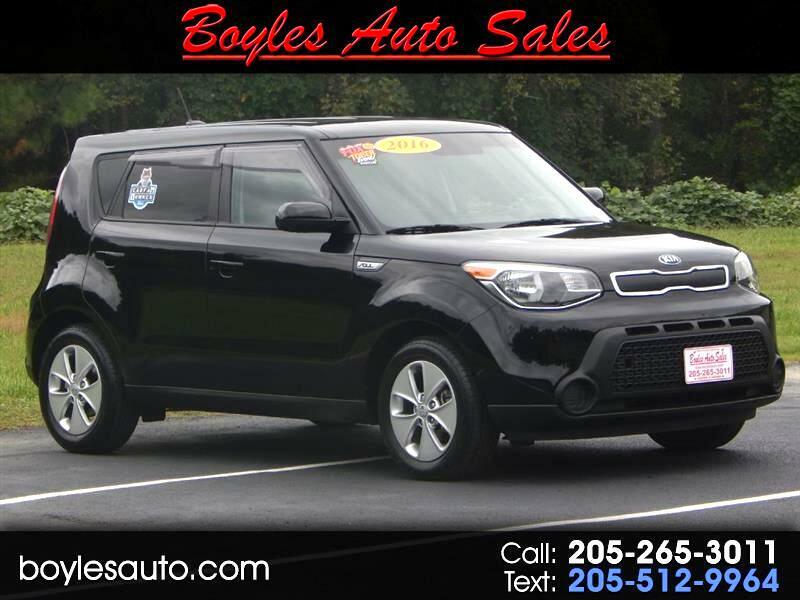 Make the short drive to Boyles Auto and take this Kia Soul for a spin today. We offer all Types of financing with intrest rates starting as low as 1.99% wac, so you can drive this Soul home today. Also, will you will find at Boyles Auto A FREE LIFETIME POWER TRAIN WARRANTY THAT COVERS THE ENGINE, TRANSMISSION, AND ALL THE DRIVE TRAIN. Call Scott at 205 265 3011, Randy at 205 269 3196. Visit us online at boylesauto.com, to view our complete Inventory Today!! Buy online at boylesauto.com just click on the apply for credit tab. Thank You, and let's talk!